Clackamas' Jeff Nelson excelled during the Cavaliers' Class 6A baseball championship season on the strength of three pitches -- fastball, change-up, and a knuckle curveball. 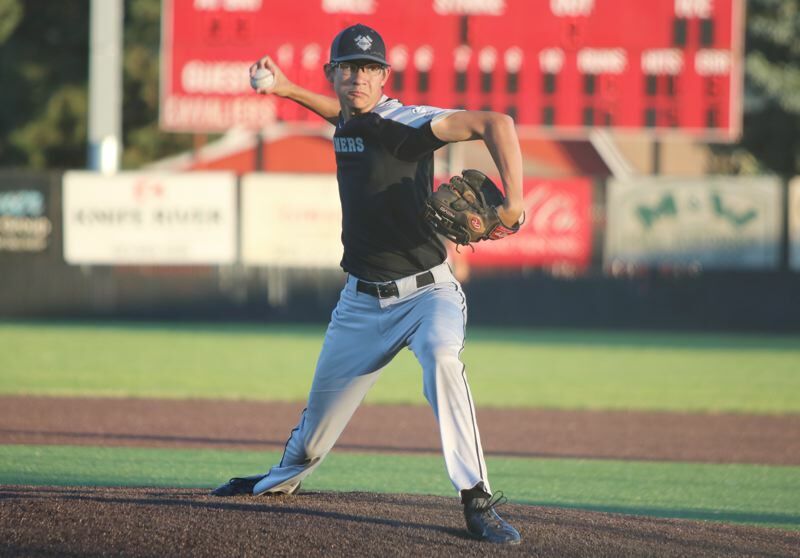 This summer, as Nelson pitches for Clackamas' Oregon Independent Baseball Association team, the Hammers, the junior right-hander is fine-tuning, not experimenting. "What I'm working on is getting more consistent with all three of my pitches," Nelson said. "Being more consistent with all three is going to be big going into next season." So, which one of the three pitches needs to the most work? "The least consistent pitch, I would say, is my change-up right now," he said. "It's actually not even that inconsistent. It's just the one that I don't have the most control of and the one I can't throw for a strike every single time, but I'm getting better with it. "I'd say I throw it for a strike 60 percent of the time, which is a lot less than any of my other pitches. So, at least when I'm throwing bullpens and playing catch, the change-up is definitely a good pitch to toy around with, just to get more comfortable with throwing it." Nelson has ascended to the No. 1 spot in the rotation following the loss of senior starters Caden Hennessy and K.C. Reilly to graduation, and with that he has had to take a closer look at his mound presence and how he handles adversity. "Nellie needed to learn to have better composure on the mound," Clackamas pitching coach Tom Bohlman said. "In the spring, when things didn't go his way, whether he walked a guy or hit a batter or someone made an error or he gave up a hit, there were times he didn't handle it well. "At the beginning of the summer, that's one of the things I challenged him on is just having better composure. And there have been times in the last few weeks when, yeah, we've had a few rough sports, and I think Nellie has handled it pretty well." Nelson handcuffed McMinnville on Tuesday when he tossed a two-hitter in a 10-0 romp that was called after five innings. He faced one sticky situation in the fourth inning with runners or first and third with one out, but got out of it with a double-play grounder. "The experience Nellie gets this summer is invaluable," Bohlman said. "I know it' snot the epxerience like pitchng in a quarterfinal playoff game, but just the interaction that he and I have calling a game or the interaction that he has with his catcher is important. "With K.C. and Caden, I know their mound presence as sophomores compared to what it was like as seniors was almost night and day. So, evan a summer ball game like this (against McMinnville) is important, because over time, as starts accumulate, you're going to develop better mound presence and have a better feel for what the heck is going on out there." In seven starts, Nelson is 6-0 with two shutouts and a 0.91 ERA heading into Wednesday's 7 p.m. OIBA tournament opener against Sandy at Wilsonville High School. "Yeah, it's been a pretty good summer," said Nelson, who in 38 1/3 innings has allowed 10 runs (five earned) on 20 hits with eight walks and 27 strikeouts. "Getting a lot of innings last srping with the varsity was a lot of help as far as being comfortable on the mound and having a good defense definitely helps, too. "The thing about summer ball is it's a little more relaxed. We try out some new guys, see who fits, see who can do the job, and test out new things and see what works." Clackamas still has six of nine starters from last June's championship final, and enough players who saw significant time in reserve roles last season to fill the vacancies at catcher and in the outfield. After Nelson and Grote, the top pitching prospects Kyle Kirsch, Greg Mehlhaff, Grant Schoen and Jaden Shaw. "I think it's not so much about Nelson and Grote holding down the top two spots," Clackamas caoch JohnSarntson said. "It's who will be the third and fourth guys? It kind of looks like Mehlhaff and Schoen right now. They're getting a lot of innings and we starting to see progress. "If they can, in a sense, replace who Nelson was as the No. 3 starter last spring, I think that's going to be important for us."